Lorn Pearson has been active and interested in exercise all of her life. It was only when she became overweight in 2008 that she really got into exercising and eating healthily to get results. Since then Lorn has lost almost two stone and almost 10% body fat and believes she has found the secret to losing weight and keeping it off. Lorn is a running and swimming coach and she writes her lornpearsontrains.co.uk blog. She loves to help people and answer any questions they might have about being active, losing weight, maintaining weight loss and being healthy. Lorn has spent years trying new ways of working out and has slowly improved her diet, week by week, so that she now eats good quality food little and often. She gave up alcohol in 2009, but sometimes has the odd blow out with food, so she has a varied and balanced diet. Lorn does intermittent fasting one day a week, where she fasts for 18-24 hours that day. Lorn has run 5ks right up to marathons and ultra marathons, and has taken part in and been inspired by other exercise types including spin fit, Insanity, Body Pump, yoga, circuits, running groups, gym work, Metafit and Basketball. Lorn is now in the shape of her life and wants to help you to get into the shape of your life too, with some of the information she’s learned over the years. 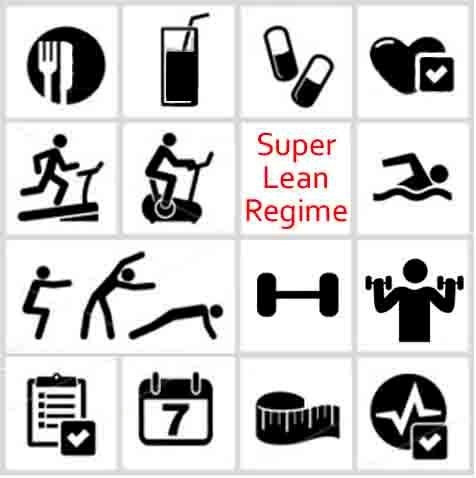 The Super Lean Regime is a culmination of years of Lorn perfecting how to lose weight, get fit, maintain the weight loss and be healthy. It’s the way she lives: healthy and active and always looking for her next challenge to take her to the next level. She wants to help you to get to the next level and beyond and she hopes that the Super Lean Regime will help you to do just that.